This pattern is up on eBay from UK seller lookingforabargains (from whom I recently purchased this). Of course, the downside of ordering from UK sellers at the moment is that it seems they're having a postal strike! I also ordered a bunch of Liberty babycord from eBay right before they walked out, so I have that feeling you get when you believe, superstitiously, that the universe has overreacted to your behavior. I mean, I *knew* I didn't need any more Liberty babycord, but it was so beautiful … but jeez, wouldn't it have been easier for the universe just to cause a minor eBay error? A postal strike seems a bit excessive, frankly. So I'd like to apologize to anyone else who may have been caught up in the chastisement the universe prepared for me. That Liberty babychord you linked to “beautiful” is REALLY beautiful. Is there any paper trail I can follow to obtain some of this fall pattern or something similar to it? i know just what you mean, erin. the UK postal strike is part of my punishment for 1) buying a region-free dvd player so i can 2) order from amazon.co.uk every DVD available with david tennant that we can’t get here. including the un-cut, unexpurgated Doctor Who(s) and Torchwoods… it was, perhaps, the universe says, carrying a crush a bit too far. 1) buying a region-free dvd player so i can 2) order from amazon.co.uk every DVD available with david tennant that we can’t get here. including the un-cut, unexpurgated Doctor Who(s) and Torchwoods… it was, perhaps, the universe says, carrying a crush a bit too far.That is an awesome plan and nothing to be punished for. What is the deal with cutting out little bits of Dr. Who. We watched the end of season 3 last week (I had watched it on YouTube earlier) and had to fill in the spots that had been cut out for the other folks in my family.Sheesh, I’m glad at least I already knew Martha had called Dr.HotMcHotty to see if he was still alive after she told the Dr. “this is me getting out”….Hi Erin, glad to see your back to blogging. They CUT Dr Who over there? Hurrah – there is at least some advantage to being British! The postal strike is a right royal (mail) PITA – a lot of companies, such as Amazon (Bonnie, you may be ok) are using other carriers, though. That seller has some really nice patterns in some decent sizes… must… resist… Erin (sorry for the Dr Who hijack), do you have an online source for Liberty prints then? I LOVE this dress. Could never wear it (too large in the top), but LOVE it nonetheless. 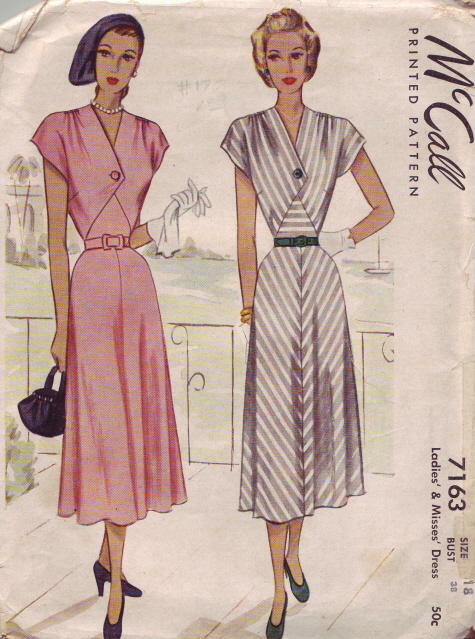 I would absolutely go with the red button, belt and piping (if, that is, I knew how to sew). If you haven’t already answered this to death, what is a good sewing machine (new, with buttonholer in case I get that far) for an adult beginner? Whoosh….I thought I caused the mail strike by buying six 1940’s-1950’s knitting books. Glad you’re back on schedule. Being a non-working person I generally have no clue what day of the week it is. Imagine what your two day hiatus can do someone like me!btw Fab Fabrics!!!!! Erin!The postal strike has just cost me about 500 in airline tickets. I have to fly back to the UK from North Carolina unexpectedly, because the letter that’s forced me to do this was caught up in the postal strike.And now I found out it’s due to your ebay karma? Shocked.On the other hand if you want me to go to Libertys for you whilst I’m in London, drop me a line. I was wondering why my ebay sales to the UK were down! I guess I’m in lala land myself. So glad you’re back! How do you like our 30 degree drop in temperature in the Chicago area? I am ready for my fall wardrobe, and am even considering adding some dresses or skirts. This, for somebody who normally wears dresses to weddings, is really saying something. And all due to you. Now, isn’t it about time for another installment in the Secret Lives of Dresses? I’ve got to bang on about the “waists” on those drawings. Dang. Who was the model, Malibu Barbie? I love those dresses. I hope to see your rendition of the stripe version. Never mind…just saw the link on the sidebar. Duh!! Lovely dresses, I wish my torso was longer and slimmer. I thought the London postal strike was the universe’s act of prevention in collusion with my dh– preventing me from buying anything priced in pricey British pounds! I daresay, it has worked for now. But you said Liberty fabric and that has almost overridden my curiosity for the shoes on the next post. they don’t make ’em like they used to, huh? It is damn hard for a gal to find a well designed dress these days! I happened on your blog a few weeks ago, and you’ve yet to disapoint. As a fellow sewer, pattern-maker and designer,good eye! I got here too late to buy the dress, and I can’t find it elsewhere! Help! Where else can I shop for patterns such as these? ?